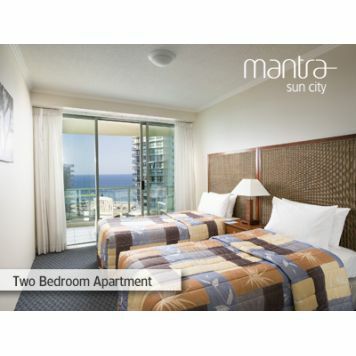 Located in the heart of Surfers Paradise, Mantra Sun City offers luxury accommodation just one block away from the beach. 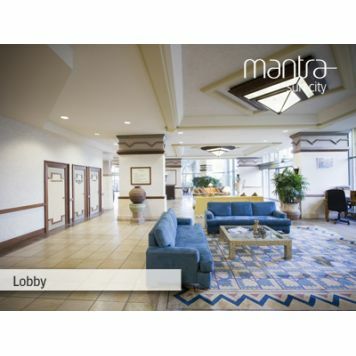 Mantra Sun City offers many guest services such as 24 hour reception, complimentary secure parking, room service, in room internet access, tour desk and laundry service. Leisure facilities consist of an Aztec-inspired pool featuring snake-like waterslides, indoor and outdoor whirlpool spa, Calmer Therapies day spa, gym, tennis court, games room, sauna, steam room and Sayas Restaurant. Our own Sayas Restaurant offers contemporary Australian cuisine ideal for the whole family. Accommodation options range from Hotel Rooms to self-contained Two and Three Bedroom Apartments and Penthouses, most with panoramic ocean and or hinterland views. All accommodation types feature Aztec-inspired decor and facilities include cable TV and private balconies in most rooms. All apartments and penthouses offer the added convenience and comfort of fully-equipped kitchen, laundry facilities and private balconies. Take advantage of the resort's wide range of facilities, or head down to the beach for a casual stroll along the esplanade, finished off with a meal at one of the many cafes and restaurants on offer in Cavil Avenue. 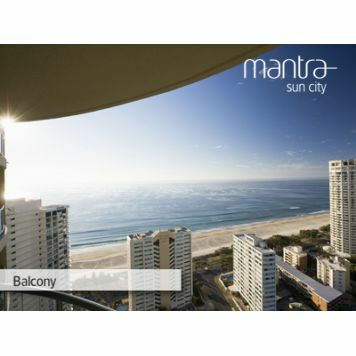 Whatever you fancy, Mantra Sun City is the perfect location for your next Surfers Paradise getaway. Enjoy sensational contemporary Australian cuisine while viewing our soothing reflection ponds and mystical fire spouts. Sayas Restaurant offers an extensive selection of beers (domestic & international), cocktails and mixed drinks and Australian/New Zealand wines that are affordable and compliment any dish. 1 Bedroom Apartment (2 people). 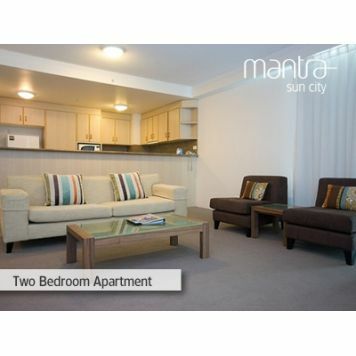 Fully self-contained 1 Bedroom Apartment with king or twin bed configurations, fully equipped kitchen and laundry, air-conditioning, cable TV and in-house movies, and private balcony with hinterland views. 1 Bedroom Apartment (2 people). 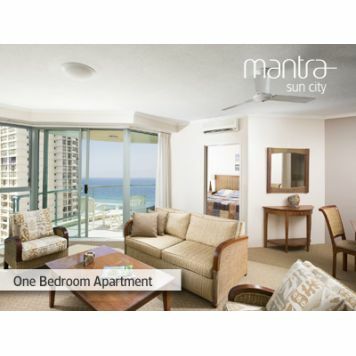 Fully self-contained 1 Bedroom Apartment with king or twin bed configurations, fully equipped kitchen and laundry, air-conditioning, cable TV and in-house movies, and private balcony with ocean views. 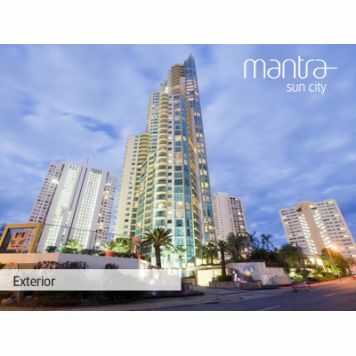 MANTRA SUN CITY!!! FUN IN THE SUN!!! 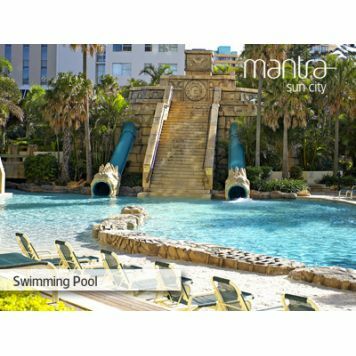 Breathtaking Views, Outdoor Lagoon Pool & Waterslides, Lifeguard On Duty, Indoor Heated Pool, Licensed Restaurant, Tours Desk & 24 Hour Reception, Free Parking, 200 Metres To The Beach!!! Rates are for 2 people. Extra adults $40.00. Extra children $40.00. The room caters for a maximum of 3 adults, and a maximum of 1 child but cannot exceed 3 guests in total. 2 Bedroom Apartment (4 people). Fully self-contained 2 Bedroom Apartment with king and twin bed with dual-key entry, features fully equipped kitchen and laundry, air-conditioning, cable TV and in-house movies, and private balcony with hinterland, pool or garden views. 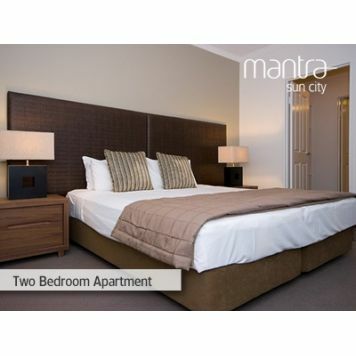 2 Bedroom Deluxe Apartment (4 people). Fully self-contained, with king and twin bed, features fully equipped kitchen and laundry, ensuite with spa bath, air-conditioning, cable TV and in-house movies, and private balcony. FANTASTIC FAMILY SAVINGS. Breakfast for 2 adults and a midday late checkout. BONUS Kids under 12 years eat free for breakfast. 3 Bedroom Ocean Apartment (6 people). Fully self-contained 3 Bedroom Apartment with king and twin beds with dual-key entry, features fully equipped kitchen and laundry, air-conditioning, cable TV and in-house movies, and private balcony with ocean views. All rooms are equipped with IDD/STD telephones with data ports, allowing quick and easy access to the Internet. Secretarial services including faxing and photocopying are available. There is internet booths and wireless broadband internet access in lobby. Extra guests charged at $40 per night. Free under cover security car parking, accessible only with a room key. 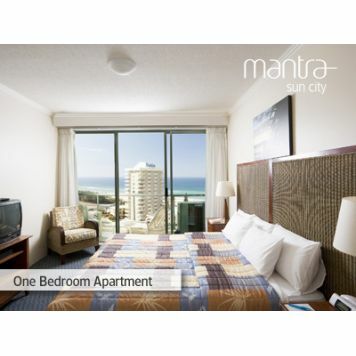 Synonymous with the Gold Coast, Surfers Paradise is known as the entertainment capital, with major events occurring year round. Vibrant and alive, Surfers Paradise is famous for its beautiful weather, long stretches of coastline, bronzed surfers and theme parks. Experience the thrill of a roller coaster or the entertainment of a live show with the family at one of the theme parks. For the serious shopper, there are exclusive fashion outlets and duty free stores, beach markets and a major shopping and dining precinct. 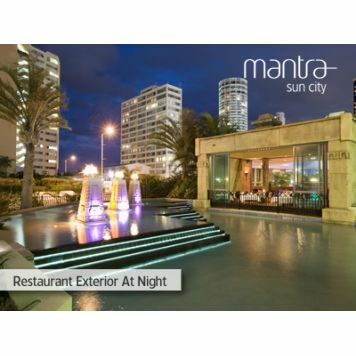 Whatever takes your fancy, the centrally located Mantra Sun City is the perfect base to explore the area.